Beyond your friends actually announcing: “I’m vegan too now!” What more could one ask than to have friends who lend themselves so happily, willingly, without confrontation or mockery, to weekends of vegan adventures. For I cannot return the favour. I cannot join them for weekends of chowing down on steaks and slices of cheese. So I went to London, saw some wonderful friends and ate as much food as I could squeeze in. First, I met friends at wellbeing oasis The Wild Food Cafe in Covent Garden. 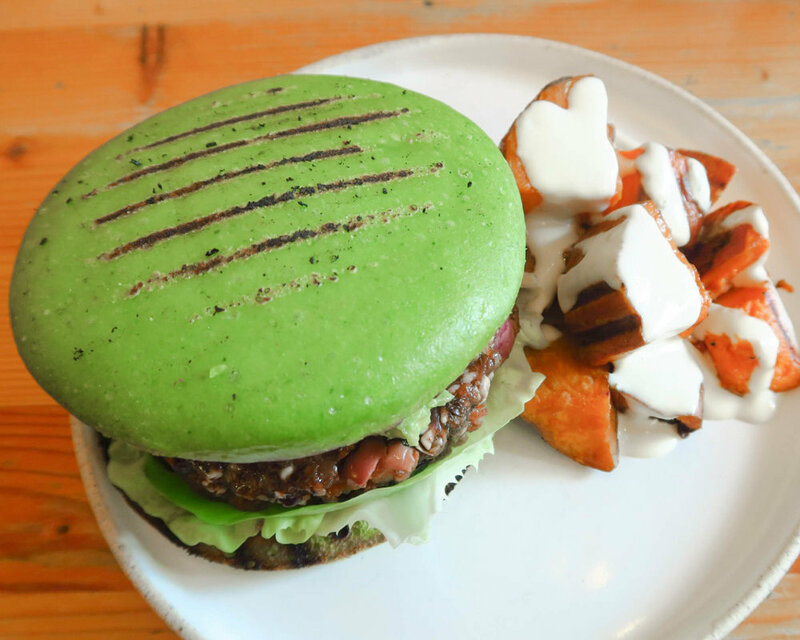 I had a green burger - look how delicious! This was followed by some kind of chocolate slice of heaven - below. Side note: I recently went out for dinner back in silly old Wiltshire. I treated myself to the ‘salted caramel cheesecake’ which, I soon discovered, was not salty or caramelly or a treat. It tasted like whizzed up nuts. What a waste of calories. The Wild Food Cafe nailed it with this chocolate number. Then, I met a friend for a stomp around Broadway Market. 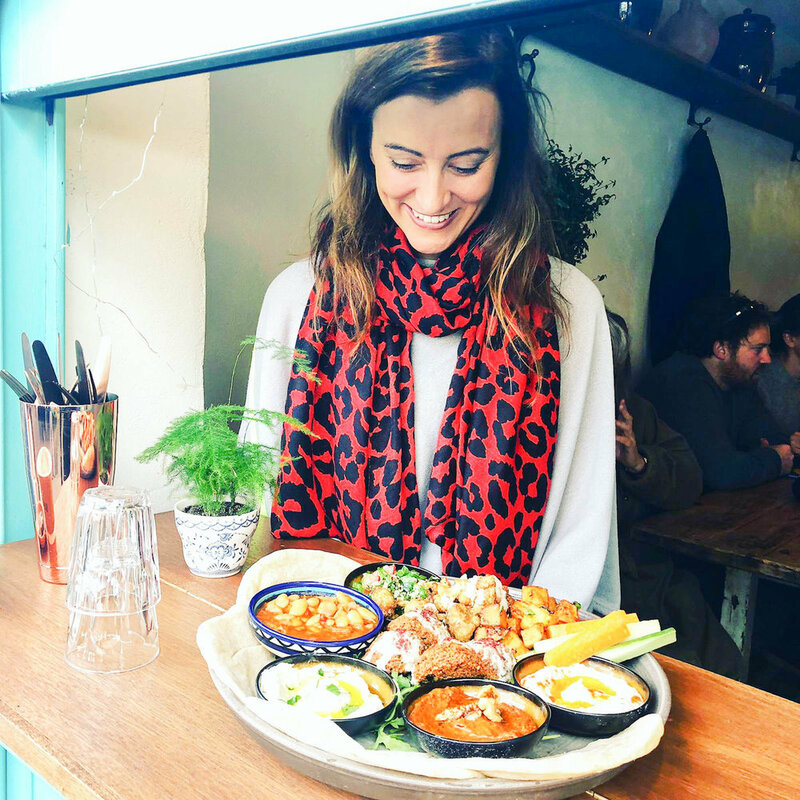 Here we have a lovely man from Urban Falafel standing afore an array of plates piled high with vegan friendly Lebanese treats. He was bang up for having his photo taken. 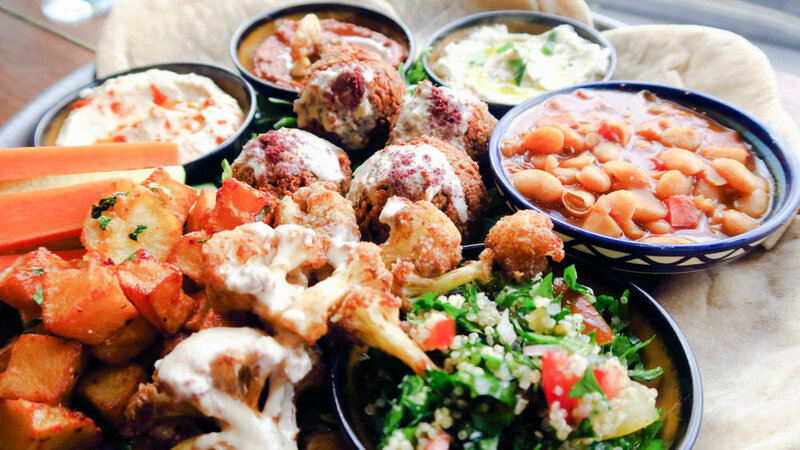 Urban Falafel. He makes your wrap! What struck me most while mooching about this market was how many stands were entirely vegan. The revolution has begun in London - I’ll let you know when it reaches North Wiltshire. Doughnuts from Cross Town doughnuts. Now that’s how you do salted caramel, Wiltshire! 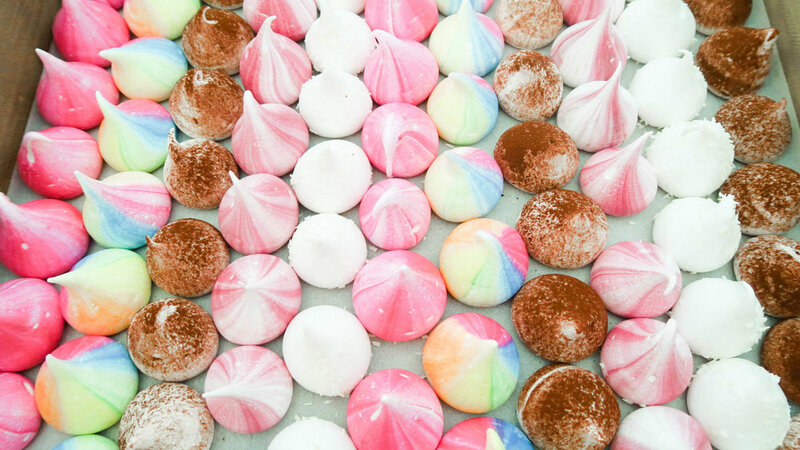 That’s an entire tray of multi-coloured vegan meringues. We bought five and ate them right there on the spot - absolutely delicious and somehow managed to do that thing meringues do where they’re melty and chewy and soft and crumbling all at once. But without the side helping of indefensible mistreatment of chickens. I stopped to tell the fun guy (boom!) 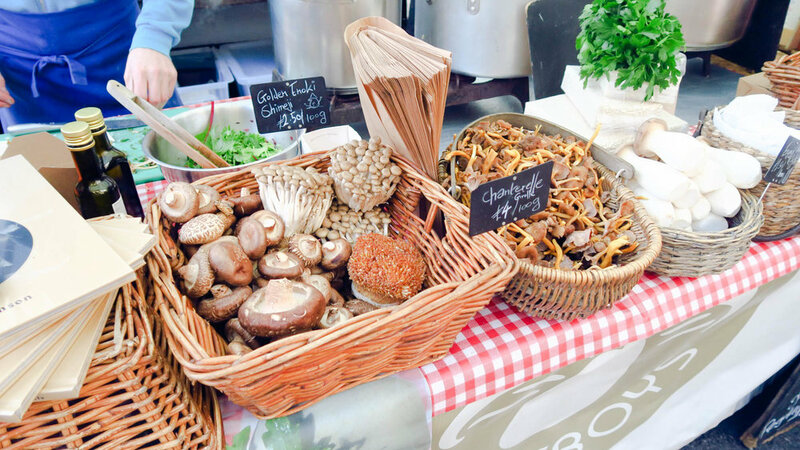 from mushroom chaps Sporeboys (brilliant) all about our recent harvest of pink oyster mushrooms. He said if we seriously go into the mushroom business, he’d buy our shrooms. Our first customer! I bought some excellent books I’ll review on here soon. Having LOVED The Diary of A Bookseller I am now making an effort to buy my books in bookshops rather than Amazon and it’s an all round better experience. I didn’t even care that I bought so many books that carrying them all the way back to Wiltshire was really painful. I can eat my bodyweight at weekends, just you try and stop me. For lunch we ate a mezze while sitting in the window of Baba Souks. Here I am watching the world go by… well actually I appear to be watching my food. 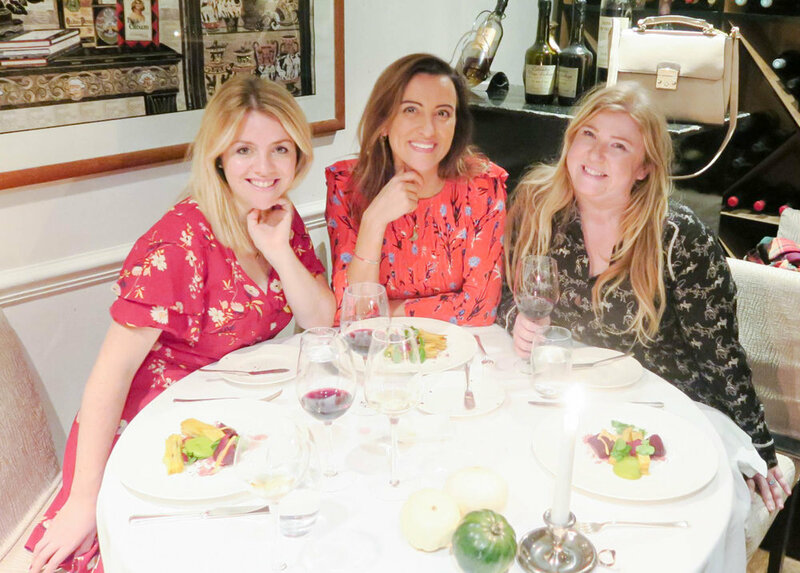 Later, after some digestion, we dined at Gauthier Soho - which is ludicrously expensive but I justified it because I was celebrating ten years in business. I interviewed proprietor Alexis for Vegan Living ages ago and vowed to visit his restaurant one day. This was the day. This guy was in charge of our carrots. Much as I’d love to be a millionaire, it’s a bit weird being treated like one. I wanted to steal a napkin for Gaz as they had a fancy ‘G’ stitched onto them, but I suppose millionaires don’t steal napkins so they’d have known it was me. I can’t show you the food because it was too dark for good photos. But the seven course vegan tasting menu (with seven wines) was spectacular. London is absolutely smashing the vegan game. At another point in the weekend, we visited Genesis, which was so millennial I thought I might have to show ID just to prove I was young enough to eat there. I interviewed proprietor Alex not long before our visit, so I thought I might get a freebie - perk of the job, sometimes. And I did indeed - we got a free mouthful of ice-cream. Oh, I know, stop showing off! We can’t all get free mouthfuls of ice-cream!